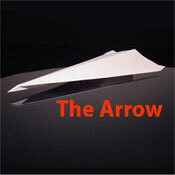 If you have made a paper airplane before, chances are it was the Arrow. This was the first and easiest plane I have ever made and it flies really well too. To make this paper airplane you will need only a single sheet of paper. 1. Fold a sheet of paper exactly in half long-ways, and re-open it so you have a crease separating the two halves. 2. On one end of the paper, fold each corner in towards the center to the point where the inside edges are even with the centerline crease. 3. Starting at the very tip of the point, fold the paper down on each side so the inside edges line up with the center crease. 4. 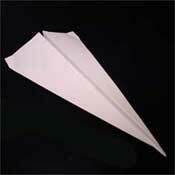 Turn the paper airplane over and fold it in half along the centerline. 5. Fold the first wing with the line of the fold running nearly parallel to the centerline of the plane. Make this fold from 1/2 to 1 inch from the center. Step 6 shows this fold more clearly. 6. Fold the second wing exactly as you did the first. Your Arrow may need some fine-tuning before it will fly perfectly straight.